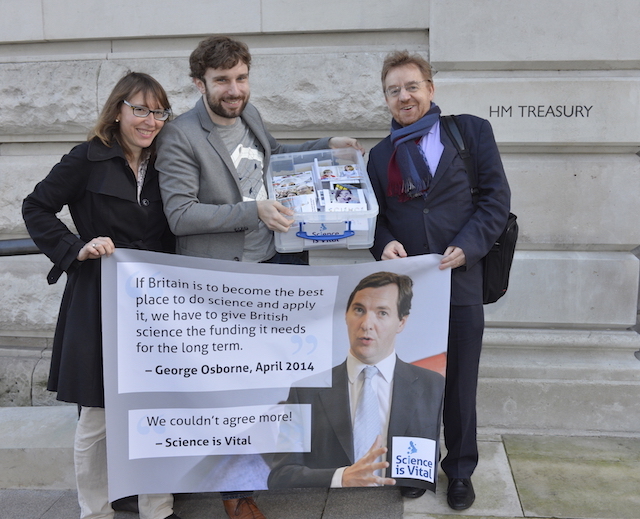 Our Science: As Vital as Ever campaign culminated on Wed 18th November 2015 with the delivery of well over 1600 postcards to George Osborne at the Treasury. 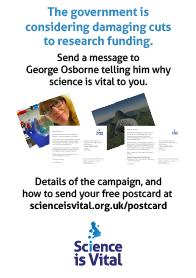 The postcards were submitted from scientists and supporters of science from all over the UK in the preceding weeks. All voiced their support for science and their concerns that it might be cut in real terms in the Comprehensive Spending Review. A big thank you to everyone who took the trouble to send a message to George Osborne. We will find out on Wed 25th November whether he has heard our call. 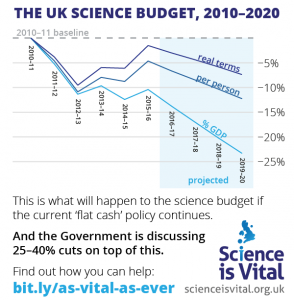 What’s happening to science funding? 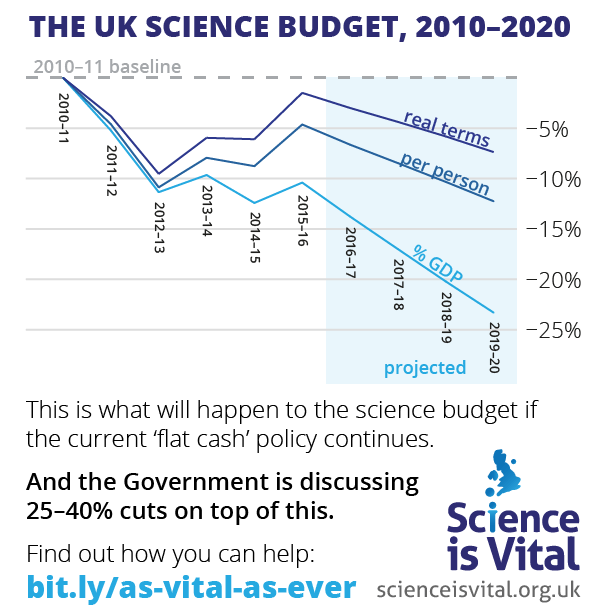 Over the last five years, real-terms funding of science in the UK has declined by 5%. Britain now spends only 0.44% of GDP on publicly funded research and development, the lowest level of investment of any of the G8 countries. And there’s worse to come: the government is threatening cuts of 25%–40%. If we don’t act now, there’s a serious risk that the UK will lose its leading international position in science. More worryingly, our economy won’t be equipped to face the challenges of the future. We need your help. Watch the video of our rally on October 26th in London and spread the word to everyone you know that science is vital. Help us advertise the campaign where you work using this handy postcard or poster. Watch share our short campaign videos on funding of research into cancer, energy or blue skies research. We’re also asking for donations to help us cover the costs of running the event, live-stream and campaign. If you can make it to our London event, you can make a donation when you buy your ticket. If not, we’d be very grateful for any donations sent via PayPal or Bitcoin. If you or your organisation would like to make a larger donation, please get in touch.